In creating this historically disputed scene, the artist was spurred partly by thoughts of vengeance. This iconic painting, which was damaged by a drunken vandal last week, has a long and complex history. 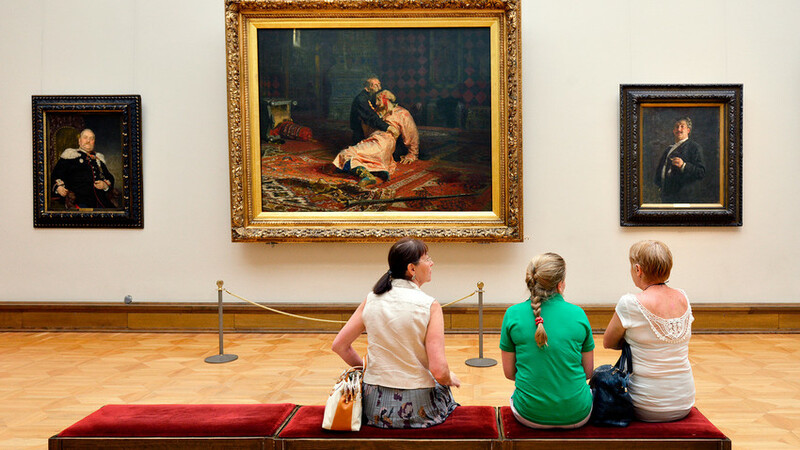 Painted by famous Russian artist Ilya Repin, the canvas depicts a legendary episode from the life of Ivan the Terrible, when he allegedly killed his son Tsarevich Ivan in a fit of anger (this theory has never been conclusively proven). Ilya Repin was inspired by two events: the cold-blooded assassination of Emperor Alexander II, who was blown up in 1881, and the appearance of "The Sweetness of Vengeance," the second movement of Rimsky-Korsakov's symphonic suite Antar, which the artist first heard in Moscow. In his memoirs Repin describes it thus: "Some time in Moscow in 1881, I heard a new piece by Rimsky-Korsakov, ‘The Sweetness of Vengeance.’ These sounds took possession of me, and I wondered if I could capture in a painting the mood and effect this music exerted upon me. I remembered about Tsar Ivan." At that time, there was much interest in the personality of Ivan the Terrible. The picture was first unveiled in St. Petersburg at an exhibition by a group of realist artists known as the Peredvizhniki (Wanderers), under the title "Filicide." Patron of the arts Pavel Tretyakov was so taken by the work that he immediately acquired it. However, in 1913 religious fanatic Avraam Balashov slashed the picture with a knife three times. Color blindess prevented Repin from restoring the picture himself, and the task was entrusted to other specialists. More than a century later, the famous painting was attacked once again. Who was the son of Ivan the Terrible? Repin’s model for the Tsarevich was the mentally ill Russian writer Vsevolod Garshin, who later committed suicide by throwing himself down a staircase. Tsarevich Ivan attended all political receptions and took part in campaigns alongside his father, yet he himself was not a political figure. He was the eldest and, by all accounts, beloved son of Ivan the Terrible. By the age of 27, Tsarevich Ivan had already been married three times. Childlessness caused his first two wives to be confined to a convent, and although his third wife gave birth, he never saw the child. Following his death, his third wife was also sent to a convent. Ivan the Terrible’s pointed staff was a symbolic object and appears in other paintings of him by various artists. It is believed that Ivan the Terrible killed his son with this staff. The barge haulers: Why did Russians drag ships upstream?